The Coral Bay settlement is less than three hours’ drive north of Carnarvon on the Minilya/Exmouth Road. On arrival visitors are greeted with amazing views of pristine sandy beaches and clear turquoise waters. The real drawcard for the area is the Ningaloo Reef which starts just metres from the shoreline, being one of the world’s only 5 fringed reefs. This unique natural landscape where the desert meets the reef, teamed with a wide range of accommodation and other facilities means the area exudes a laid back holiday vibe all year round, allowing visitors to enjoy life at a more relaxed pace. Experience the wonders of the reef and the marine wildlife that call it home, by swimming and snorkelling at locations such as Bill’s Bay. This calm and protected area is a sanctuary zone (no fishing permitted) meaning the area is brimming with a variety of tropical fish. Alternatively you can take advantage of one of the professional tour companies who offer combined coral viewing and snorkelling, manta interactions, sailing, kayaking, scenic flights, fishing charters and diving tours to various hotspots just within the outer reef which is home to an abundance of coral, turtles and manta Rays. Snorkelling equipment isalso available for purchase or hire through various operators in Coral Bay. For the adventurous land lovers, there are quad bike tours available, allowing visitors to explore some of the more remote beaches, bush tracks and dunes that surround Coral Bay throughout the day. In Coral Bay everything is just a short walk from your accommodation, such as tour booking offices, clothing stores, day spa, newsagency, and supermarket and food outlets. Services such as petrol station, ATM and internet access are also available. The Ningaloo Marine Park encompasses Australia’s largest and most accessible fringing coral reef system. Many creatures are found in the Marine Park, including whale sharks (the world’s largest fish), turtles, dugongs, dolphins, manta rays and humpback whales. The marine park has been divided into zones to protect the biodiversity of the natural environment, while allowing for recreational and commercial use. The fringing coral reef is what makes the Coral Bay area so special. Living coral is delicate, with only a thin veneer of living tissue covering the hard coral skeleton. Once damaged, coral often takes many years to grow back. Coral Bay is an authorised vessel only area to allow for family friendly swimming and snorkelling. Snorkelling is fantastic just off the beach from Bill’s Bay and Paradise Beach. For the more adventurous, there are a number of commercial boat charters available from Coral Bay. Jump on board with one of the following tour operators who offer snorkelling tours from Coral Bay. Coral Breeze Coastal Cruises offers Reef Explorer tours which is a half day of sailing the crystal clear waters of the Ningaloo Reef. Snorkel Discovery is a full day of unlimited snorkelling and for those who enjoy magical sunsets; you can jump on board a Sunset Sail. Ningaloo Reef Dive and Snorkel offer full or half day snorkelling trips with manta rays and the local marine life of the Ningaloo Reef. Snorkel tours with whale sharks are also available between March-July. Ningaloo Marine Interactions offer the ‘The Best of Ningaloo’, this tour offers all the elements of the Manta Ray tour plus so much more. Coral Bay Eco Tours offers a Marine Eco tour; the tour offers swimming with Manta Rays and other seasonal marine life such as reef sharks, turtles, giant clams and octopus. Call the Carnarvon Visitor Centre to find out prices, availability and book. A Glass Bottom Boat tours are available Coral Bay Charters and Coral Bay Eco Tours. It’s a great way to experience the marine life of Coral Bay without getting wet. You can view the colourful fish and delicate coral garden on board and learn about the biodiversity of the Ningaloo Reef. Those who are little more adventurous will enjoy jumping on board a two hour coral viewing and snorkelling tour which will take you to our favourite snorkel sites on the reef. Call the Carnarvon Visitor Centre to find out prices, availability and book. The loggerhead, green and hawksbill turtles are the three varieties of turtles that can be seen in Coral Bay. You can jump on board a turtle eco tour with Coral Bay Eco Tours, you will experience turtles feeding in their natural habitat and swim alongside these magnificent air-breathing reptiles. Turtles are command marine life that can also be found on snorkelling and diving tours. Don’t forget your turtle #selfie! Sail Ningaloo is a luxurious 51ft sailing catamaran, you can experience the Ningaloo Reef in a very unique way. You can jump on-board one of three different experiences, there is the four day Sail, Snorkel and Dive Getaway, the 6 day Ningaloo Escape and 10 Day ultimate Ningaloo experience, all showcasing the extraordinary marine life of Coral Bay. Coral Bay is an extremely popular destination so when the destination is fully booked, Sail Ningaloo is always a great alternative. Call the Carnarvon Visitor Centre to find out prices, availability and book. Coral Bay’s specialists in bottom and game fishing, Mahi Mahi Fishing Chartersoffers excellent and exciting sport fishing opportunities using top of the range quality tackle. They proudly support state wide bag limits and the tag and release program. The Ningaloo Reef provides an abundance of fish to be caught, including Marlin, Sailfish, Wahoo, Mackerel and Dolphin Fish (Mahi Mahi). On the bottom there are Emperor, Cod, Perch, Trout and many more. The playful humpback whale is the most frequently spotted whale species on the Ningaloo Reef. Humpback whales pass by the Reef on their migration to and from Broome. They make the long migration up north each year from Antarctica to mate and give birth in the warm breeding grounds. Tours will be back from August to November, tours are available with Ningaloo Reef Dive and Coral Bay Eco Tours.Call the Carnarvon Visitor Centre to find out prices, availability and book. Your options for fishing, snorkelling and exploring Coral Bay and the Ningaloo beaches increase dramatically if you have a 4WD vehicle. You could base yourself in Coral Bay and fish and/or snorkel somewhere completely different every day, or head out of town for a few days of camping on the wilderness coast. 4WD destinations close to Coral Bay include Five Finger Reef, the Turtle Cliffs and beaches further south until Warroora Station. Coastal Adventure Toursrun self-drive Quad Trek adventures which are unique and exciting. Discover the spectacular and isolated coastline of Coral Bay by exploring beaches, bush tracks, pristine bays, dunes, clifflines, abundant wildlife and picture perfect sunsets. Snorkel amongst turtles and see them feeding while experiencing the raw beauty of the unique coastline. You will be at the controls of the modern and well maintained specially designed two seater quad bikes. Ningaloo Reef Dive & Snorkel and Coral Bay Eco Tours both offer tours swimming with the biggest fish in the world, the whale sharks from March to July. This in an incredible encounter you will always remember with experienced and professional guides. They use spotter planes to guide the vessels to the whale shark to maximise their success rate. It is a full day tour which includes lunch and refreshments, as well as all equipment and government charges. You may also see dolphins, turtles, dugongs and manta rays on this tour. Ningaloo Reef Diveis a licensed PADI outlet. You are able to go on a range of courses, whether you simply want to give SCUBA diving a try, or have decided to continue your diving education. The calm waters of Coral Bay on the Ningaloo Reef are the ideal location for your first attempt at SCUBA diving. Daily diving trips are also on offer, ranging from half or full days. The boat can accommodate scuba divers and snorkelers. 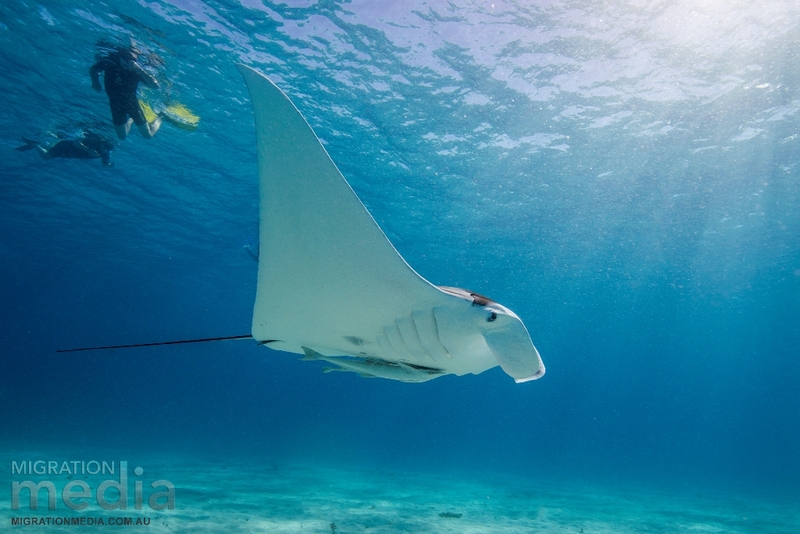 Coral Bay boasts a large population of Manta Rays and offer visitors the unique opportunity to swim with these graceful and gentle creatures all year round providing an unforgettable experience. Manta rays do not possess the protective stinging barb on their tails and as such are harmless to humans.